For Salvation Key Rings and Zipper Pulls. Message Cards for Salvation Key Rings and Zipper Pulls using only 5 or 6 Beads are available only in English. 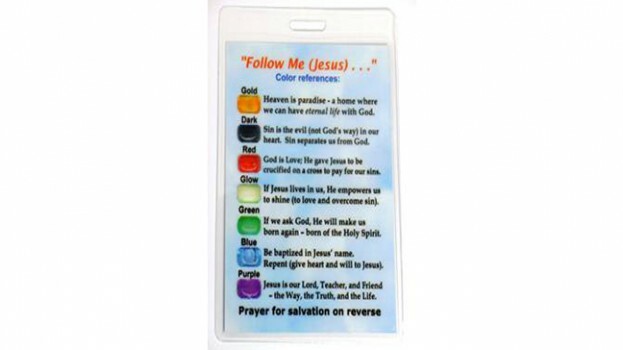 Click on Language Link to view enlargement of Message Card: English using 5 Beads, English using 6 Beads, English using 7 Beads, Arabic, Cambodian (Khmer), Haitian Creole, Japanese, Korean, Romanian, Russian,Spanish, Swahili, Zulu. 3" x 4" Salvation Bracelet Message Card laminated with rigid 10 mil lamination with slot in top end for attachment onto snap hooks. Prayer of Salvation on reverse.